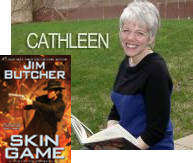 An ideal gateway into fantasy for crime story fans, Skin Game by Jim Butcher is a thrilling heist adventure with Chicago’s only professional wizard leading the gang. Narrator James Marsters is nothing short of spellbinding in telling the smart, twisty, and witty tale of a motley crew under duress breaking into the vault of Hades for the literal Holy Grail. D. Read or listen to a digital book. L. Read a book set in the Chicagoland area.